BRONZEMAGONLINE.COM: What inspired you to go into the hair business? WAILANE ELLIS: My inspiration for the hair business was my daughter Quinniah, she calls her self Pink Blush as she loves anything that pertains to beauty and fashion. In addition to my daughter I love hair and wanted to be able to provide all women with a quality and affordable hair product. BRONZEMAGONLINE.COM: What is the Pink Blush mission? WAILANE ELLIS: Pink Blush Hair is more than hair, this is a movement of beautiful women who seek quality materials and understand the important essentials of life……..their hair! Our motto and promise to our consumer(s) is to carry 100% natural Virgin Brazilian Hair imported directly from Rio, Indian hair from India and a host of other exotic human hair. Our hair is NEVER chemically processed in any way, therefore, leaves no damage to the cuticle. In addition, we strive for the best possible pricing to make Remy hair more affordable to all! Here at PBH we are elated to help promote healthy growth of your natural hair. Each track is sealed with a hair protector to protect scalp from itching and or breaking. We believe our ability to create future product opportunities and growth will only be limited by our imagination and our ability to attract talented people who understand the concept of branding. BRONZEMAGONLINE.COM: Between your hair company and management business how do you manage balance in your life? WAILANE ELLIS: Having a great partner as well as an organized team helps alot. My assistant Asia who I drive crazy on a daily basis helps me keep the LS Management side balanced. This gives me the freedom to run the hair side of the business. I collate the two companies together as women love hair and music and I thought it would be a great marketing tool to showcase my artists by supplying a sample of their music with each hair purchase. Aside from that, managing Mama Jones keeps me alert and on my feet, as I have to keep up with that woman. I think I am her age and she is mine; love her! BRONZEMAGONLINE.COM: What do you see as three important keys to owning a successful business? You have to know your consumer and picture yourself as one. I would not sell my clients anything that I would not utilize. Communication and the best customer service will bring even the slowest of businesses up. Each client can schedule to have a conversation with a PBH rep to ensure that they are in fact purchasing the correct type of hair. Trust is very important, each one of my clients will establish trust in Pink Blush Hair as we want to build partnerships with our clients; we want them to be able to fee comfortable that they will receive the highest quality in their purchased product. After all, our clients are our biggest marketing tool. Last but not least, faith in God, He is the higher power and as long as I trust in Him, there is no mountain that I cannot climb. BRONZEMAGONLINE.COM: How does Pink Blush give back to communities? PBH is a very new company; my main objective is to get involved with the Cancer Society and the Alopecia Society as well as the shelters for battered women by offering them the highest quality hair for a fraction of the price. I would like to donate hair to these astonishing societies and hope that by us doing this, we can help put a smile on someone’s face since we cannot cure their illness or heal their wounds. Their will be a ‘I am not my hair’ campaign going on for those woman who want to take their wigs/weaves off and show their bald heads. We will have special earrings made for them and showcase them on our site. This was inspired by Mama Jones and her sister Joy Williams who is a cancer survivor. I love giving back to others; I am blessed and will share it with the world if I can. WAILANE ELLIS: I m elated that I am participating and the hair will be a part of the show. BRONZEMAGONLINE.COM: How can someone become a client/and or purchase your hair products? BRONZEMAGONLINE.COM: What’s next for you? for Pink Blush? WAILANE ELLIS: PBH’s next steps is to push to become a household name, in addition, we are going to put together a PBH and LS Mgmt tour where we can show the world who we are. 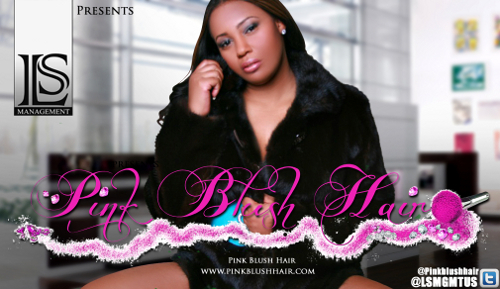 You can have luxurious hair while listening to great music from my artists-D. Ellis, Montana SP and The Playboyz.